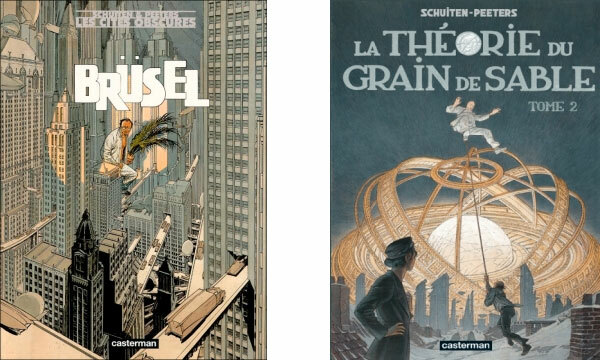 François Schuiten es un dibujante de cómics belga que le da una importancia especial a la arquitectura y a la ciudad en sus dibujos. Con una hermano arquitecto, y tomando inspiración de otros arquitectos como Victor Horta y Étienne-Louis Boullée, creó una serie junto a su amigo Benoît Peeter para la revista mensual de cómics belga À Suivre , titulada Les Cités Obscures en la que cada una de sus historias trata sobre un edificio o una ciudad. Fabrica un mundo en él que arquitectos, urbanistas, y últimamente "urbatects" [y este término viene en el artículo original], son las principales potencias y la arquitectura es la fuerza impulsora detrás de la sociedad. Unos dibujos que también recuerdan a Gaudí y a Hundertwasser [éste último por su relación entre la vegetación y la arquitectura]. 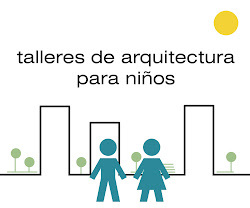 No en vano su interés por la arquitectura y el diseño va más allá y ha diseñado estaciones de metro y escenografías. Su trabajo ha inspirado a otros para representar la ciudad sostenible como al arquitecto Olivier Dain Belmont. The discipline of architecture has developed in a process diametrically opposed to living organisms. To build is to destroy everything before, on a portion of nature, and remove all traces of life, to deposit instead dead materials in geometric order. Have we not too quickly forgotten that we are above all biological beings settled on a planet itself alive? To find our bearings, we would first redevelop a local environment designed also as a living organism, kind of intermediate stage between the planet and us. But to do this, we must find new raw materials stripped as possible of the artifices of industrialization as the price to pay for this type of development inevitably leads to depletion of the earth. The development of archiborescent cities would have a major impact on the quality of our environment by removing pollution; we would benefit in many powerful ways from such an approach. 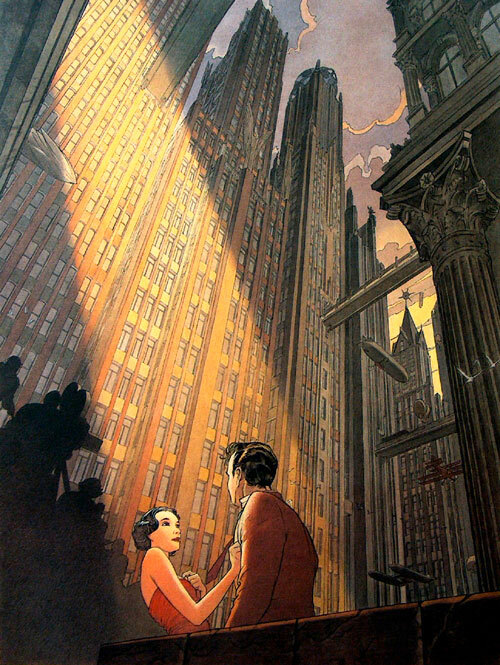 The first image and the last four images are made by Luc Schuiten, the elder brother of François Schuiten. 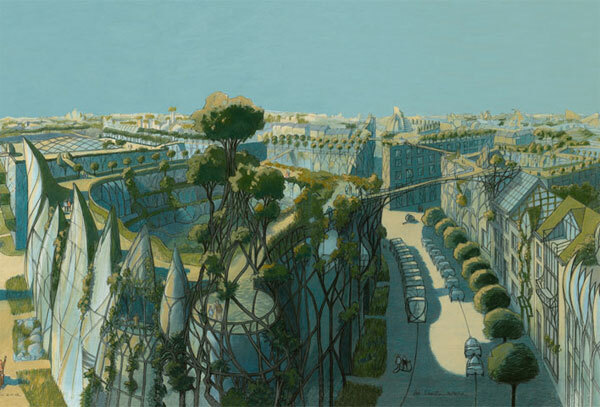 See https://www.altaplana.be/dictionary/schuiten_luc for more information about Luc. Thank you so much for the info, Joseph. It has sense. 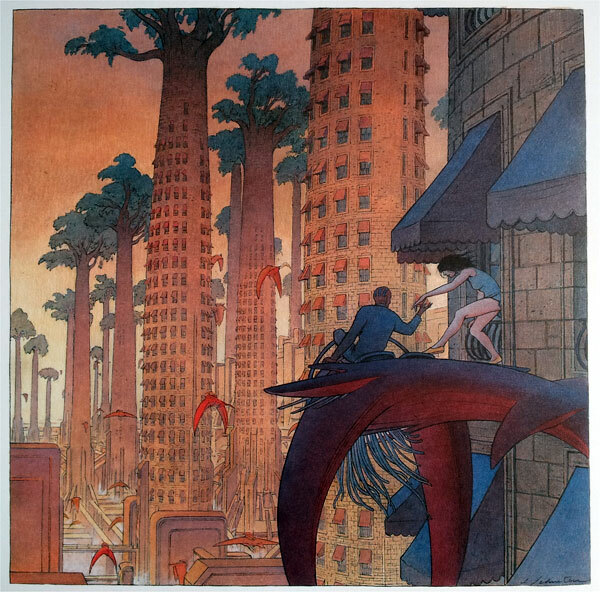 I love Schuiten work, and that’s a very good surprise to see my drawing in your article, side by side of Vegetal City. The purpose of this mail is to thank you, and inform you that “Les Editions Cosmografia” publishes my work: “Permacité” ( Permacity). 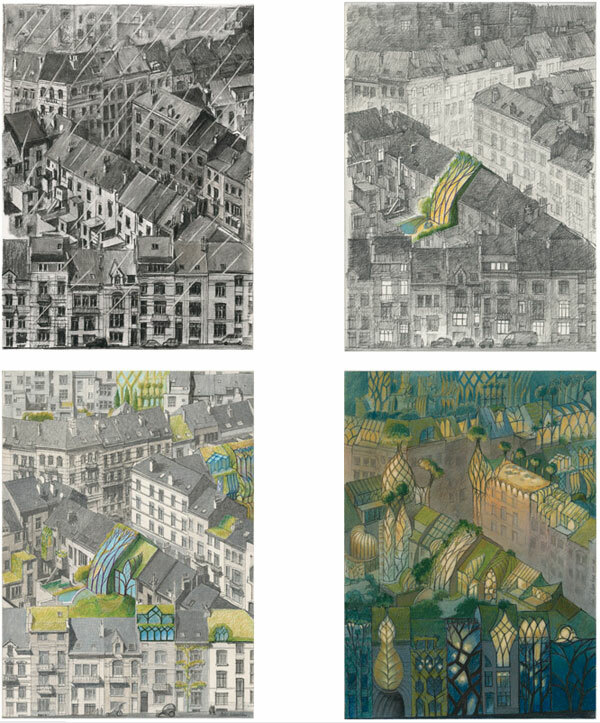 Expanding cities another way – an illustrate essay. How can we re-enchant cities? How can we create a symbiosis between manmade and natural ecosystems? In a context of world ecological and demographic crisis, marked by an increasingly massive and destructive influence of the urban space on the environment, it is necessary to think the city anew. This book proposes solutions in the spirit of permaculture. First, it identifies the attractive characteristics of the detached suburban houses, which is an architectural typology the majority of the population loves, but which is also the main cause of urban sprawling. Then it builds a reflection towards a coherent model. Through playful manipulations of a virtual model and on the solid foundations of a step by step analysis of the urban complexity, this model creates a new way of building and rebuilding cities on themselves. Today, Permacité exists only in French.